In the summer of 1999, while India and Pakistan were engaged in a war, Amitava Kumar—a Hindu Indian writer living and teaching in the United States—married a Pakistani Muslim woman. That event led to a process of discovery that prompted Kumar to examine the hatreds and intimacies joining Indians and Pakistanis, Hindus and Muslims, fundamentalists and secularists, writers and rioters. In Husband of a Fanatic, Kumar chronicles the entanglements that his new marriage provoked—from ambivalent encounters with family to his disquieting lunch with the amiable bigot who had posted Kumar’s name on his internet blacklist of Hindu traitors. Kumar also travels across the South Asian continent, visiting a classroom in riot-torn Gujarat, a village beside the Ganges, and a psychiatric ward in Kashmir. With a poet’s eye for detail, Kumar draws a map of violence, moving between the wars and nuclear rivalry dividing two nation-states. 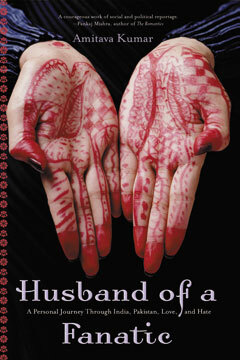 Employing elegant and spare prose, Husband of a Fanatic is a fiercely personal reflection on the idea of the enemy.